Sipping my coffee with the cool air coming in the window before sunrise this morning, I can hear the first songs of the new day – a northern cardinal, a late spring peeper, and my favorite, the melodious call of a wood thrush. Last evening, before the storm, others were singing – the yellow-throated warbler that may be building a nest in the yard, Carolina chickadees, a summer tanager. Over the past few years, I have unfortunately lost some ability to hear high frequency sounds, so I am missing the calls of many other spring migrants, unless they are very close. Melissa tells me there are many black-throated blues out back, a northern parula, and a pair of hooded warblers down the hill. But, I still hear plenty in these woods, and elsewhere as I travel. It is the season of song, it is spring. The urge to sing is strong. During a slight break in the storm last evening, a wood thrush commenced calling, even though it continued to rain and blow. 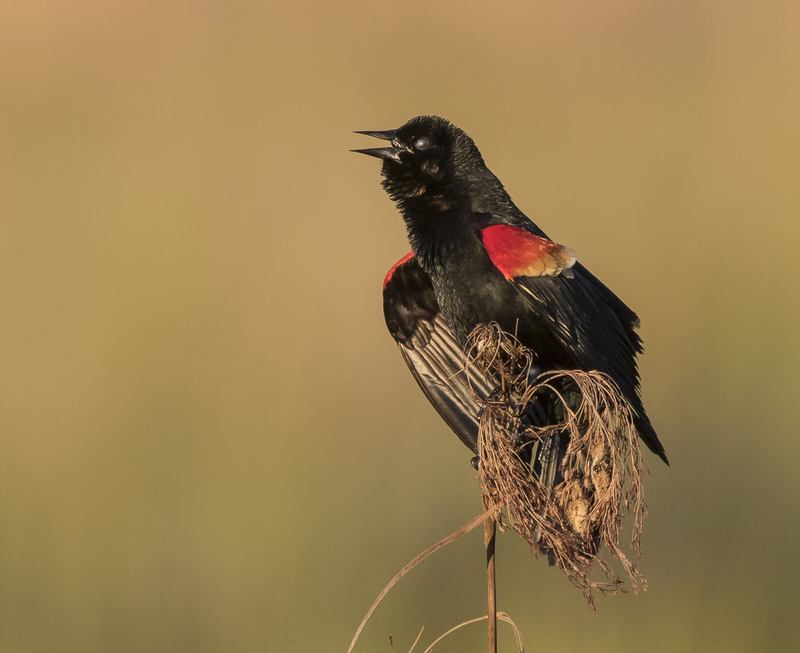 One of the joys of spring bird-watching is to hear these songs, and to see the songsters in action. 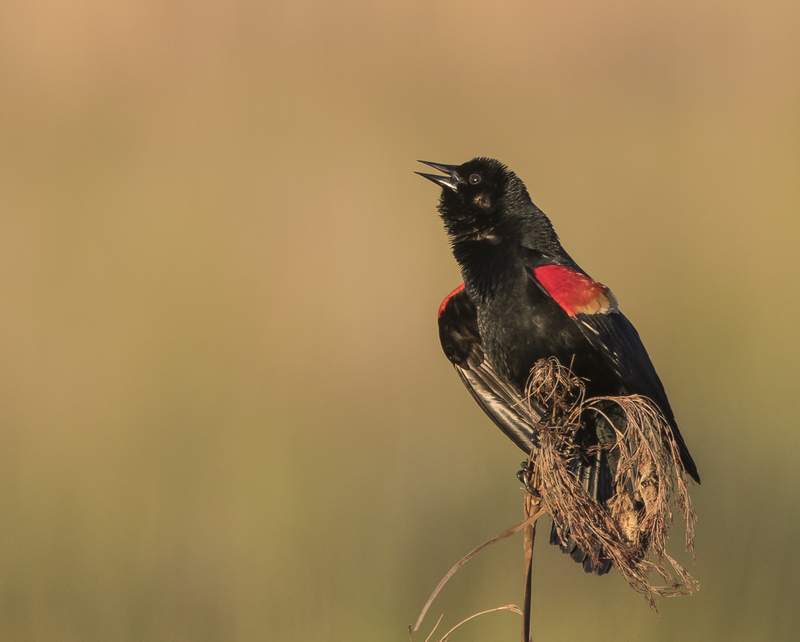 Last weekend, on a trip to the Pungo Unit of Pocosin Lakes National Wildlife Refuge, we were treated to a couple of energetic vocal displays, the kind that stick with you, and imprint the melodies in your head. Early in the day, there was a lot of stopping and listening for warblers (at least by the others in the car), and prairie warblers seemed to be everywhere in the front half of the refuge that is dominated by thick pocosin vegetation. 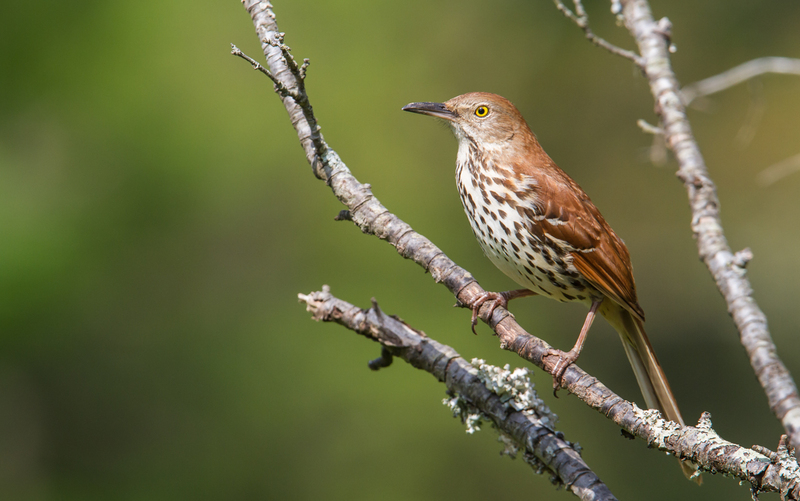 Later that afternoon, we heard the loud call of a brown thrasher (Toxostoma rufum), a member of the mimic thrush family that includes mockingbirds, catbirds, and thrashers. 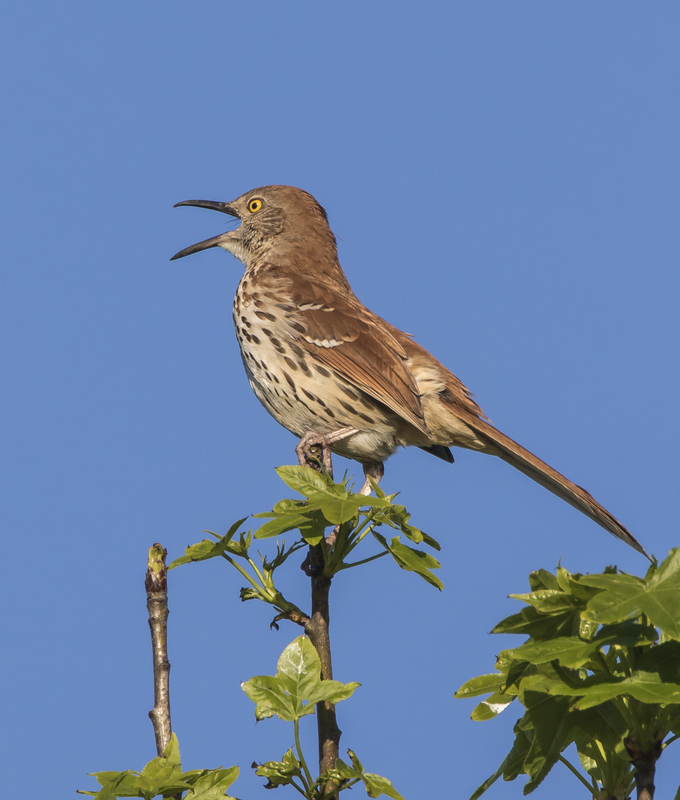 Normally a secretive bird, foraging in thick vegetation, male brown thrashers change their habits during the breeding season and let forth with a series of loud notes from atop a high, conspicuous perch. We drove by a clump of trees at an intersection of refuge roads a few times before stopping to find the singer. 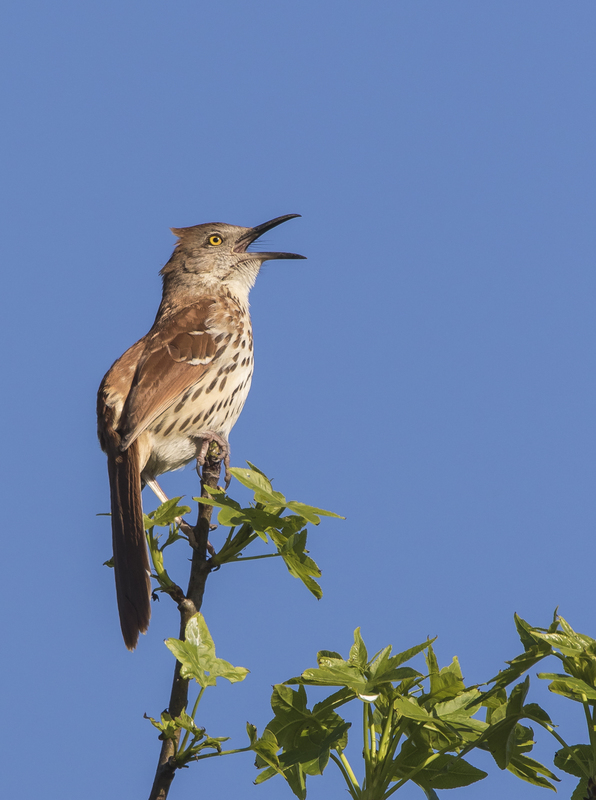 There, atop the tallest tree limb, was a brown thrasher belting out his melodious song. Distinguishing the varied songs of a gray catbird, a northern mockingbird, and a brown thrasher can be tricky (all three species occur on the refuge). But, the thrasher seems to sing louder than the others, and usually repeats a phrase in its song twice, whereas the mockingbird usually repeats three times, and the catbird only once. 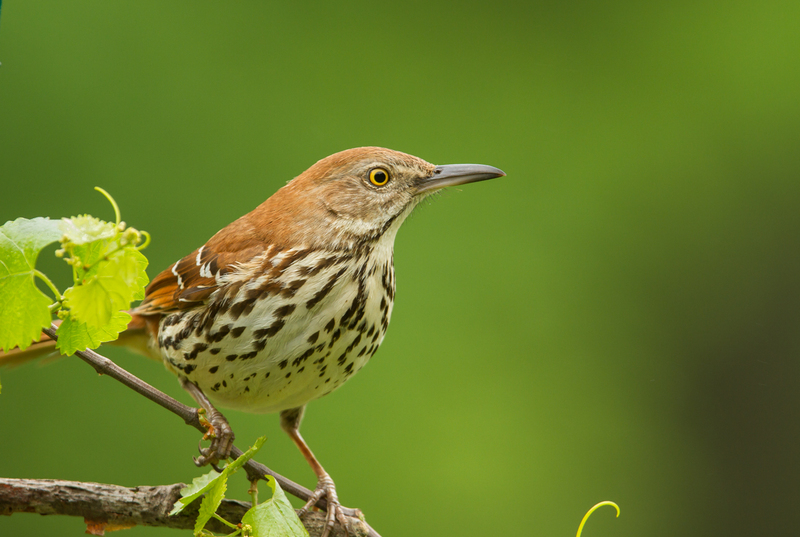 Brown thrashers are known to have a repertoire of over 1,000 songs, with some researchers saying it exceeds 3,000 song phrases, giving them the largest playlist of any North American bird. This guy was certainly proud of his singing, and probably continued long after we finally moved on. Late in the day, we passed by the large marsh making up one of the refuge’s moist soil units. Managers seasonally control the water level in this impoundment to maximize the production of food and access for wintering waterfowl. This time of year, the water is shallow, with abundant marsh and wetland vegetation, making it an ideal place for many species of birds. We saw American bitterns, lots of great blue herons, and heard several king rails. 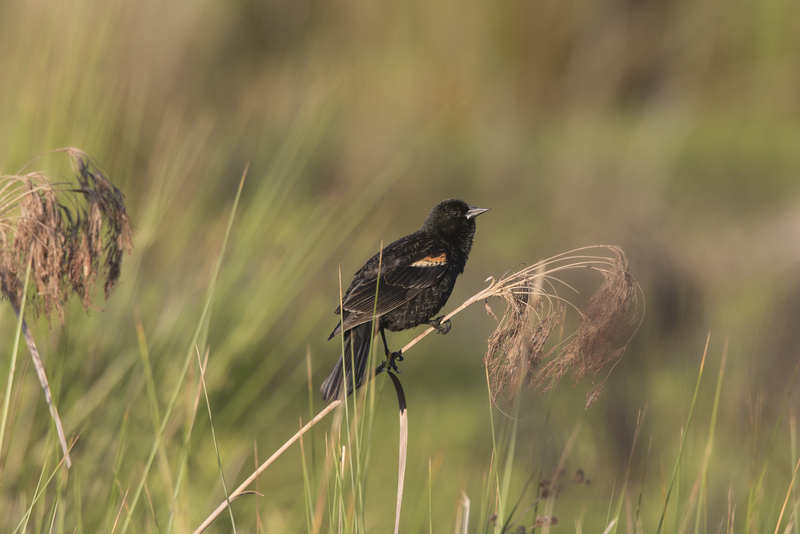 But the birds of the hour were the red-winged blackbirds (Agelaius phoeniceus). Males were everywhere in the marsh, flying about, chasing other males, and establishing or defending territories. They would land on a tall reed, and burst into…song? 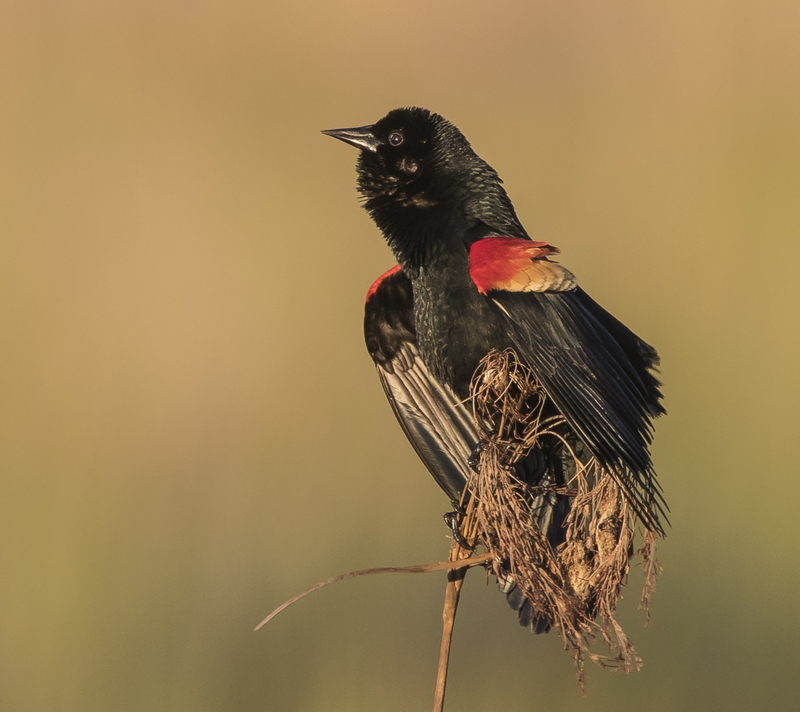 While we watched, several males were displaying their classic behavior – alight on a prominent perch (usually a tall reed); lean forward, puff up, spread your tail feathers and arch your wings, and let loose with a loud conk-la-ree! The most prominent visual aspect of this display is showing the bright red shoulder patch on each wing, their so-called epaulettes. 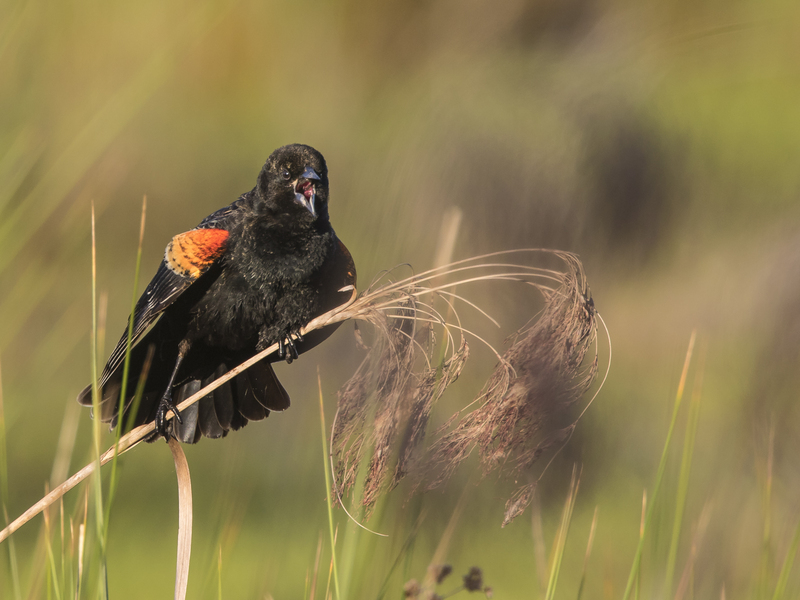 I wrote about the displays of red-winged blackbirds in an earlier post. Studies have shown that displaying epaulettes can be used to both defend a territory from other males, and to attract a female. In a series of experiments, two researchers explained some of the intricate aspects of this behavior in what they termed the “coverable badge hypothesis“. In one test, they temporarily dyed the epaulettes of some males to a black color and found this reduced the social status of these birds. In another study, by observing males that already had established a territory, and then watching newcomers into that territory, they noticed that the intruders usually conceal their epaulettes (badges) and leave without a fight when the owners display theirs. This is believed to help reduce fights between birds that can result in injury. more sociable and nest near our homes. I see Brown Thrashers all year in North Carolina, but, in winter, I find them more often in the Coastal Plain, rather than around my home. But, a few weeks ago, a male Brown Thrasher appeared in the garden and began singing from near the top of a nearby ash tree. His is a beautiful, varied song, befitting a member of the Mimic Thrush family, which also includes the Gray Catbird and Northern Mockingbird. 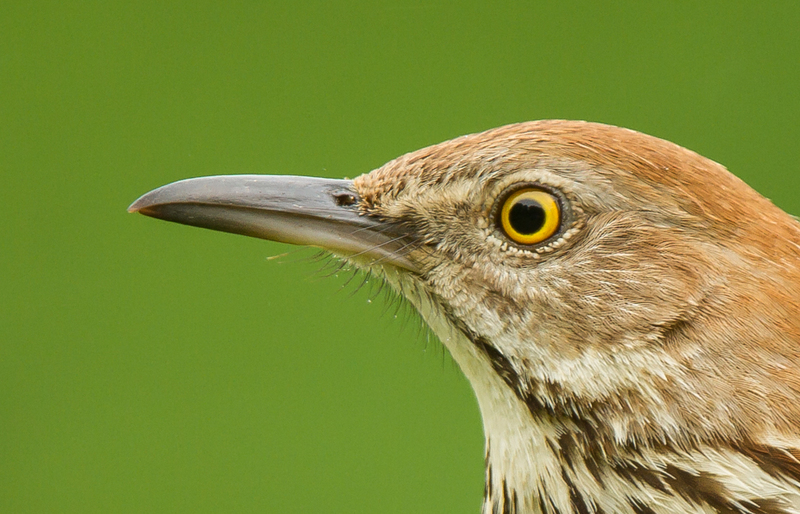 Of the three, I think the song of the Brown Thrasher is the most pleasant to the ear – clear, and often, melodious. They are said to have a songbook of over 1,000 song types. 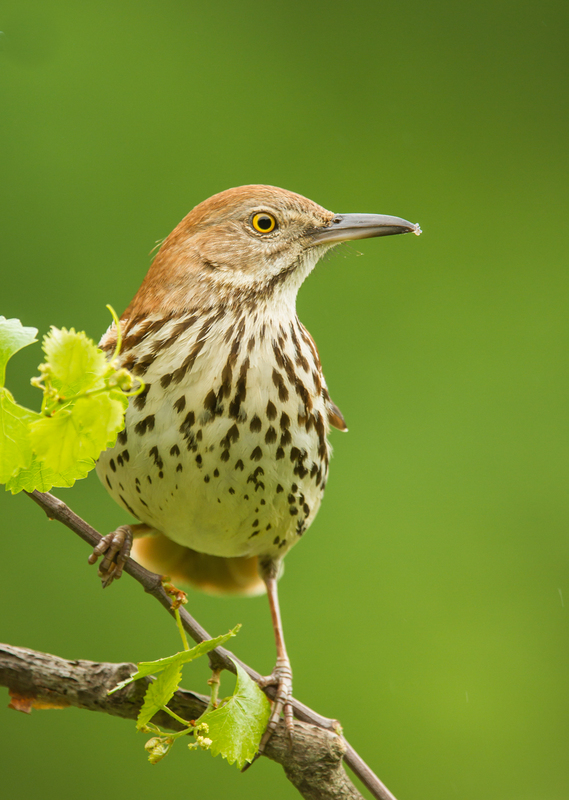 Brown Thrashers repeat their song phrases twice, while Gray Catbirds only once, and a Northern Mockingbird, three or more times in a row. 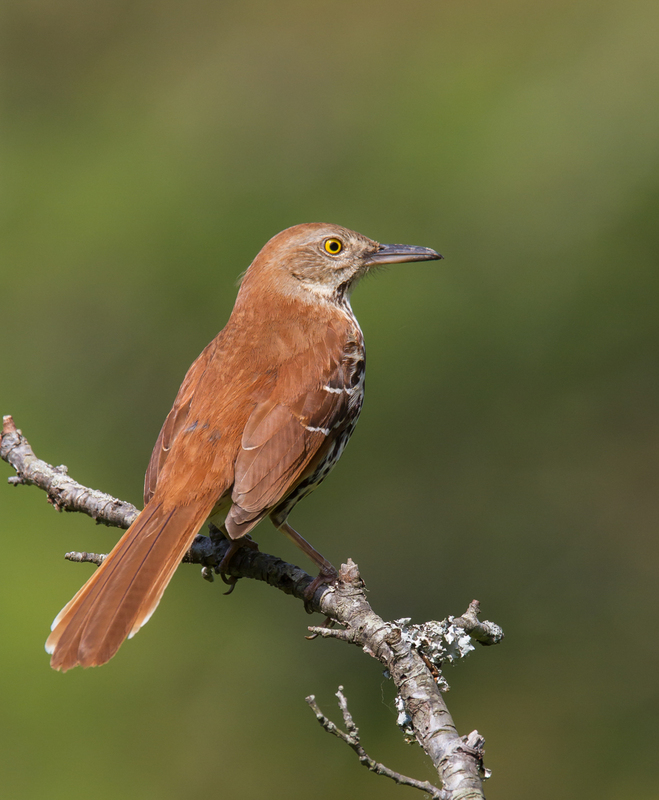 In addition to their paired song phrases, Brown Thrashers are easily identified by their large size (up to 12 inches), long tail, rufous-colored back and wings, and a speckled breast. They have two whitish wing bars and a long, powerful, slightly down-curved beak. But what I notice most, and love to see in low-angle light, is that intense yellow, glaring eye. A friend came over recently and as we sat and watched birds out by the garden fence, he commented on the Brown Thrasher feeding nearby. If they were 12 feet long instead of 12 inches, we would all be very afraid of them as they go running about, thrashing the earth with that giant beak, and staring with that intense yellow eye. He said they remind him of some sort of small predatory dinosaur. It apparently seldom scratches for its food, as do the fox sparrow and the towhee, but uses its long, strong bill much as a haymaker uses a pitchfork in spreading hay; thus, with powerful sidewise strokes, it sends the leaves flying in all directions, and then stops to pick up what desirable morsels it finds beneath them. The common name, thrasher, most likely is derived from this feeding behavior, although others have suggested it may be from the way a bird will often thrash a large grub or other insect on the ground to subdue it. And one writer noted that he had been thrashed by one of these formidable songbirds when he approached its nest. 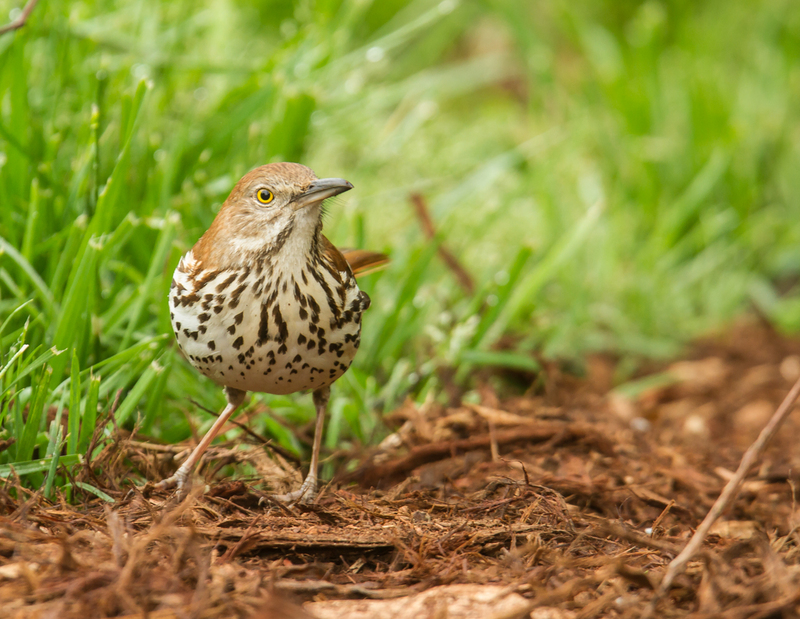 In fact, I saw several descriptions of how some Brown Thrashers will valiantly defend a nest against humans, dogs, and predators such as snakes, often drawing blood with jabs of that sturdy bill. I have not experienced this aggression even though a pair nested in the grape vines on the garden fence two years ago. When I was out working in the garden, often only a couple of feet away, the bird on the nest would simply stay put, perhaps knowing they were safe in an impenetrable mesh of sinuous stems. But, I don’t think I will be reaching in there to test their resolve should they nest again this year. I can’t get that image of a small glaring dinosaur out of my head.